Mrs. Gastro and I have a tendency to get caught up in whatever craze the television tells us to, so in honor of the curry fever sweeping the nation (thanks to an Oscar-sweeping movie neither of us have seen), we ordered Tiffin, reputedly the best Indian food in Philadelphia. Last night's order of Samosas (stole the picture above from Foodaphilia without asking), Butter Chicken (it sounds healthier when called by its real name, Chicken Makhani. Don't judge me), and Naan was particularly glorious. Firstly, ordering in saves us the guilt and glut of two entrees, and the portions are plenty, even without the vegetable side thrown in at no extra charge. 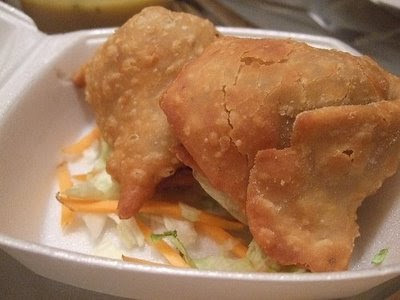 Secondly, a fried pyramid of dough stuffed with peas, potatoes, and the right blend of spices rivals a potato skin (if there were a show called Top Appetizer, these two would be in the final), and Tiffin's is the baby bear of samosas. The size and temperature is just right. Lastly, it's called Butter Chicken, but really, it's a milder version of Tiffin's Chicken Tikka Masala (white man's chicken). The tomato cream sauce is like satin sheets* enveloping every grain of rice and every chunk of tandoori chicken. It puts the "comfort" in "comfort food." The whole meal made us feel like a couple of slumdog millionaires, which is good, because otherwise, I'd be upset at the one drawback, which is that Tiffin charges for raita, a delicious cucumber yogurt sauce you can use to cool down your entrees if they get too spicy for you. Buen provecho. Tiffin's Mt. Airy outpost is located at 7105 Emlen St, Philadelphia, PA. The dining room is cozy and BYO. We usually order take away, and for $22 we can get an appetizer and an entree to split. *I've never owned satin sheets, but the way people describe them, you can imagine how glorious this texture is. I thought that somasa picture looked familiar! No worries, I like to share.